The Oz books form a book series that begins with The Wonderful Wizard of Oz (1900) and relate the fictional history of the Land of Oz. 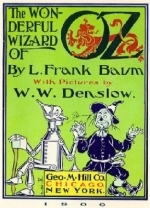 It was created by author L. Frank Baum, who went on to write fourteen full-length Oz books. Whirled away on a cyclone, Dorothy is set down in the Land of Oz and must find her way home with the help of the Scarecrow, Tin Woodman, and a pair of ruby slippers. Read for free online at the Library of Congress. In this first sequel to The Wizard of Oz, young Tip journeys to the Emerald City and discovers his true identity. Dorothy is shipwrecked and washes up on the shore of the Land of Ev where she is shortly joined by Ozma who has come to set the Queen of Ev and her children free from the Nome King. Read for free online at Internet Archive. Dorothy is precipitated into the bowels of the earth by a California earthquake along with her friend Zeb, a farm boy, Eureka the kitten and Jim the cab-horse. She meets the Wizard and they make their way to Oz after many adventures. In one of the most exciting volumes in the Oz series, Dorothy meets the Shaggy Man and along with Button Bright and Polychrome, the Rainbow’s daughter, makes her way to Oz. Johnny Dooit helps them cross the Deadly Desert and John R. Neill’s illustrations are some of his best. Aunt Em and Uncle Henry have joined Dorothy in Oz. While they are enjoying a tour of their new home, the evil Nome King is tunneling under the Deadly Desert in his scheme to conquer the Emerald City. Trot and Cap’n Bill meet Button Bright and Polychrome, the Rainbow’s daughter, on their trip to Sky Island. Ojo the Unlucky travels to the Emerald City along with the Patchwork Girl and the Glass Cat to free his Unc Nunkie from a magic spell. Betsy Bobbin and Hank the Mule are shipwrecked on the shores of the Nonestic Ocean. They meet the Shaggy Man, discover Tik-Tok the mechanical man and help defeat Queen Ann Soforth and her army of conquest among many other adventures. When the pearl pirates capture the people of Pingaree, it is up to the King of neighboring Rinkitink, his talking goat, Bilbil, and the young prince Inga of Pingaree to rescue them. Ozma is missing and with her all the magic treasures of Oz. The Tin Woodman joined by his old companion the Scarecrow and young Woot the Wanderer sets out to see what became of his old love Nimmie Amee. The Magic of Oz relates the unsuccessful attempt of the Munchkin boy Kiki Aru and the former Nome King Ruggedo to conquer Oz. Princess Ozma and Dorothy travel to an obscure corner of the Land of Oz, in order to prevent a war between the Skeezers and the Flatheads and find themselves imprisoned on the Skeezers’ glass-covered island, which has been magically submerged to the bottom of its lake. In search of his family tree the Scarecrow tumbles down through the earth to the Silver Islands. Is he really the Emperor, Chang Wang Woe? Originally credited to L. Frank Baum, The Royal Book of Oz was actually written by the young Ruth Plumly Thompson, who went on to write a total of nineteen Oz books. Prince Pompa and his friend Kabumpo the elephant must save Ozma and her fairy kingdom from Ruggedo, the wicked gnome king. Prince Tatters and Grampa set out to find King Fumbo’s head, save the kingdom from bankruptcy and find a suitable Princess. With the help of Dorothy and Bill, an iron weathercock, they succeed. Ozma’s father, King Pastoria is rescued from an enchantment and we see the last of the evil witch Mombi. The Hungry Tiger of Oz (1926) is the twentieth in the series of Oz books created by L. Frank Baum and his successors, and the sixth written by Ruth Plumly Thompson. It was Illustrated by John R. Neill. Betsy Bobbin and Carter Green, the vegetable man escape from Rash with Prince Evered with the help of the Hungry Tiger. Unsuspectingly, Peter, a boy from Philadelphia, assists the wicked Gnome King in escaping from the island where he has been banished and who is now determined to reclaim his former kingdom and ravage Oz.